Click the button below to add the RED [regular] face and body paint by TAG (R3208) to your wish list. Looking for pro quality, skin-safe face and body paint, that’s easy to use and offers vivid colour? TAG Body Art is a name you can trust. Face Paint Shop Australia is an authorised retailer; we stock the full range of TAG Body Art products in our face paint warehouse. BONUS offer: Buy 3 or more of this item and receive 5% off. Add it to your cart now! TAG Body Art face paints are offered as a ‘cake' - that is they are 'solid’, not liquid. This means a little goes a very long way, and you’ll find a standard size face paint cake should paint hundreds faces, which makes them great value for money over the long-term. HOW to remove face paint from skin? WHO is TAG Body Art? TAG Body Art is an Australian owned company. TAG Body Art supplies high quality, high pigment water-based face and body paints to the world in a range of colours, colour combinations, and product types including regular, pearl, neon and skin tones. Vibrant, opaque colours and a reputation for quality have driven TAG Body Art to take the lead as one of the world's favourite face paint and body art brands. The TAG brand is loved by professionals and amateurs alike. 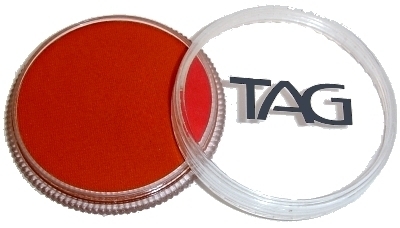 TAG face and body paints are manufactured with skin-safe ingredients. They conform to Australian Standards. This means you'll have peace of mind in knowing that TAG Body Art paints will deliver reliable results and most importantly, are safe for use on the delicate faces of children. TAG Body Art paints are water-activated. Apply with a quality face paint brush or sponge for great results. TAG body paints are made in Taiwan.